Sunday November 10th 3-6pm Go! 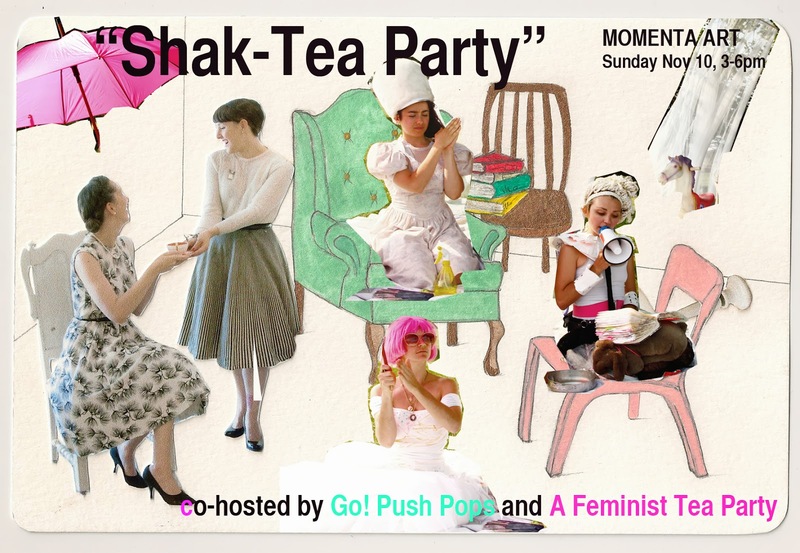 Push Pops and A Feminist Tea Party will co-host a Shak-Tea Party, an esoteric gathering and skill-share honoring the feminine principle. Light snacks and tea served, white tantric meditation, discussion of herbalism/foraging, special guests and circle work. Free and open to the public. Nu Age Hustle is a group show featuring 9 artists working in video, fabric, installation and performance. Drawing equally from elements of “New Age” and Pop culture (hip hop, fashion, and e-commerce) these artists explore ritual, earth and sky awareness, embodiment and commodification at the increasingly blurred boundary of the spiritual and the secular. Many adopting their own body as a site of resistance and agent of performative praxis, Nu Age Hustle is a show highlighting artists as global citizens and consciousness shifters. Speaking truth to power in their own unique idioms, these works pinpoint and shift social loci toward interdymanic and cosmic heights. John Miller Chernoff, a scholar of African aesthetics of social action, has broadly defined culture as “overtly musical,” in nature. For Chernoff culture is “a dynamic style or organization through ‘various mediators,’” and for these artist scavengers of it, it is ever the bright, fungible horizon. As border crossers and at times, futuristic agents of cultural upheaval, the artists of Nu Age Hustle recalibrate distinctive elements mediating contemporary daily living in ways radically experiential and spiritually raw.